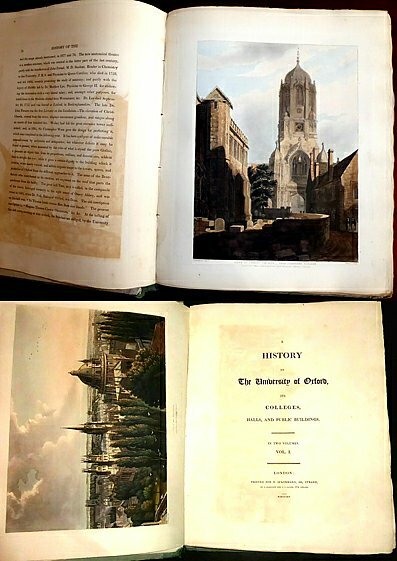 Description: London printed L. Harrison & J.C. Leigh., R. Ackermann 1814 Hand-coloured plates (81) + uncoloured portrait of the dedicatee by Westall, Pugin, Nash, Mackenzie, Turner & Sir J. Reynolds costume plates by Unwins. . Large quarto (36x28.5cm page size/binding height 38cm) contemporary sugar paper covered boards rebacked with printed labels (tips worn & lower edge somewhat shelf worn/corners a bit bumped). Half title + coloured frontisplate + title + uncoloured Grenville portrait + dedication leaf + [vi]-xiv (subscribers & plate list) +1-xxv (the city) +275pp +p index; Vol.II half title + colour frontisplate + title +262pp +pp index. Without the Founders' portraits which are not called for in the plate list and which Tooley notes were 'not issued till a later date' so the book is complete without these. Some off-setting of plates to adjacent text leaves but not affecting legibility. More than a dozen plates carry the watermark of WHATMAN 1812 and most plates are uncut (ie not trimmed) thus with slight narrow edge tanning. Ex Library with circular blind stamps (1.6cm) throughout. The verso of both titlepages have 3x4mm stamp with accession & shelf number and "enf.trans.4/70" filled in neatly. It does not show through to recto of leaf and there is now a gift book plate tipped over this. The pastedown has bookplate of F.W. Searle + initials & 1" red ink circle. Newer free endpaper watermarked 1833 and is not part of the pastedown or next free sheet. *Beautiful and very clean copy with large margins, clean unsmudged coloring on thick crisp paper (Abbey Scenery 278).